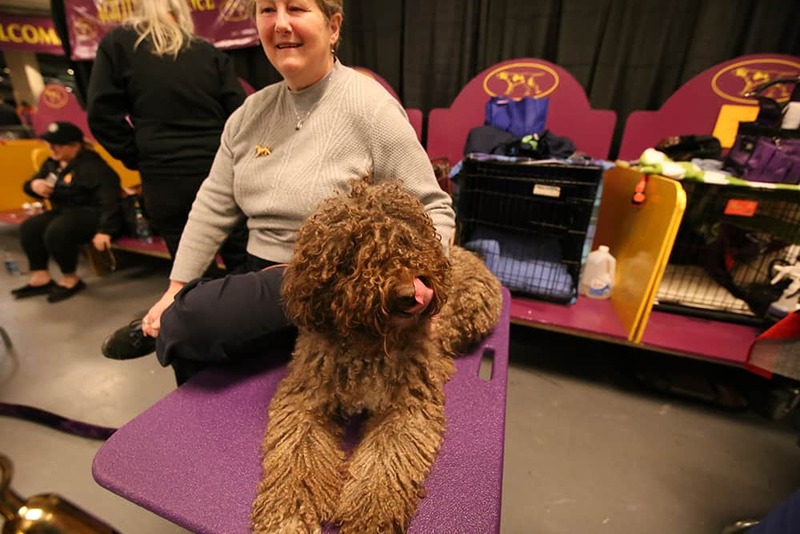 Backstage access at the Westminster Kennel Club Dog Show offers a rare opportunity to learn tips and tricks, spill little-known secrets, shatter some dog show myths, and quell some curiosities about the dogs, the handlers, and their (sometimes unusual) grooming habits. 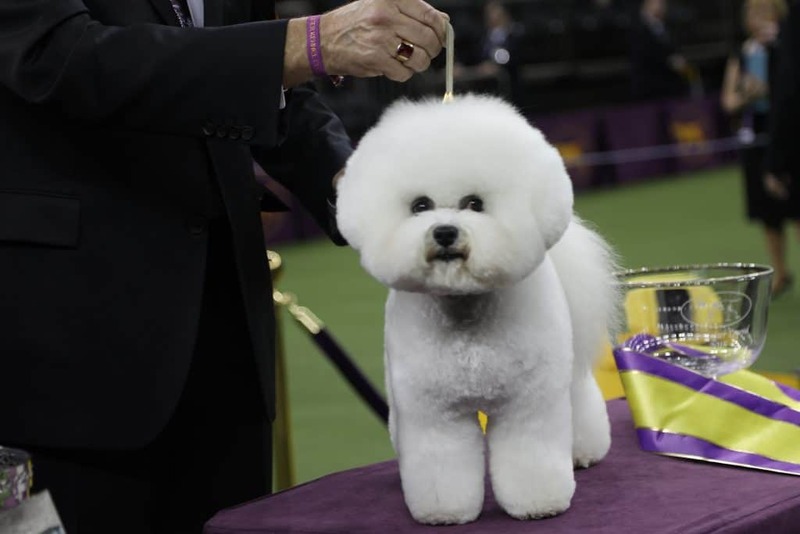 The Westminster Kennel Club dog show, essentially the Super Bowl of canine conformation shows in America, just crowned their 142nd Best in Show winner, Flynn, an adorably fluffy 5-year old Bichon Frisé! 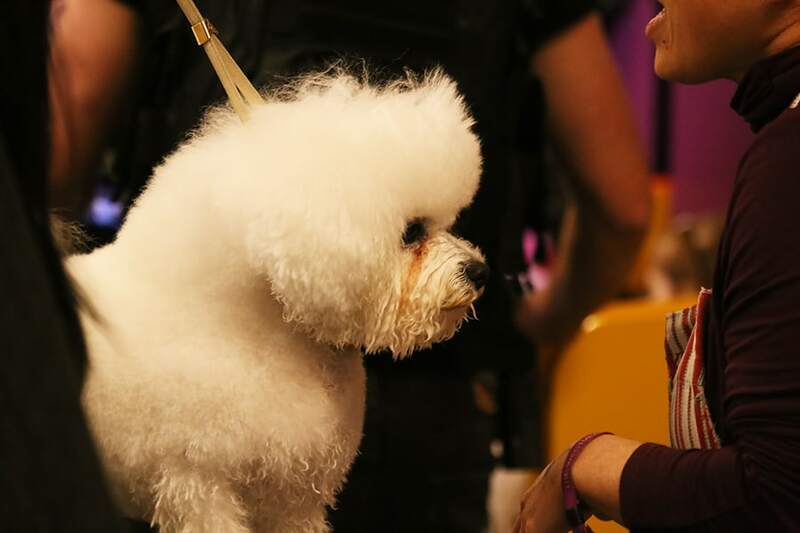 Now, unlike most dog shows, no backstage passes are required at Westminster, offering the public a rare opportunity to meet & mingle with the 202 different breeds showing in the year’s most important event. In fact, not only are the general ticket-buying public granted backstage access, the dogs and their teams of owners, handlers, and groomers are actually required to be present when the hundreds of eager dog-lovers and spectators walk through the benching area on their way to their seats inside Madison Square Garden – although it quickly becomes clear which teams (and dogs) are enjoying the spotlight and which are trying to slink back and look invisible to the troves of people passing through. Also unlike other dog shows, Westminster takes place in midtown-Manhattan, where grassy patches and potty spots are a rare sight. 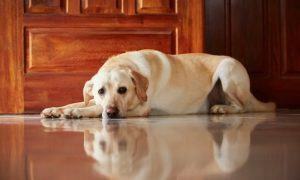 So, with hundreds of dogs needing a place to “go”, Madison Square Garden set up special indoor potty areas for the dogs. Like the canine version of a port-a-potty, these spaces are basically chain-link kennels lined with plastic and a thick bed of wood-shavings. 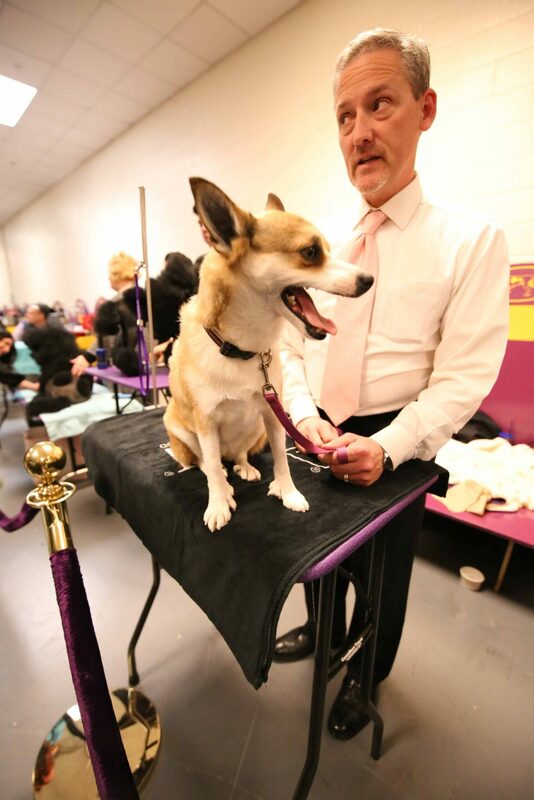 Nevertheless, the backstage access at Madison Square Garden offers a rare glimpse into the dog show world and a great opportunity to learn tips and tricks, spill little-known secrets, shatter some dog show myths, and quell some curiosities about the dogs, the handlers, and their (sometimes unusual) grooming habits. So what’s the big draw? Why would someone want to enter the dog show world with their dogs? First and foremost, it’s a love of dogs and, more accurately, the love of a specific breed. The folks at Westminster aren’t your run-of-the-mill hobby breeders, they definitely ARE NOT backyard breeders or puppy mill operators. They are people who have devoted their lives – and lots, and lots of money – to their favorite breed. We met Eva, the Best in Breed, 2-year old the Norwegian Lundehund. “Lundies” are fairly new to Westminster, having their debut in 2012. This unique breed was nearly extinct when in 1963, only 6 Lundies existed in the world. Today, through purposeful breeding the little dogs – originally bred to hunt Puffins, with some incredible physical features not present in other breeds, like a minimum of 6 toes on each foot, an ability to turn their head upward until it touches their spine, and ears that can be “pinched” closed facing either forward or backward at will – number in the thousands. Best of all, they make fabulous family pets that love to play and snuggle. And Benji, the Best in Breed, 4-year old Skye Terrier, who we learned is shedless, odorless, danderless, hypoallergenic, and, in addition to being absolutely gorgeous, is quite the cuddler when he isn’t working. So, there must be a big payout for winning Best in Show, right? Wrong. Aside from some huge ribbons, gift bags full of loot, and tons of accolades, there is no cash prize for winning at Westminster. But, any breeder will confirm that the offspring from champion dogs can bring in big bucks, particularly considering many past winners have been relatives (sons, daughters, littermates) to prior winners. Still, the dogs entering the ring at Westminster are well-loved, adored family pets. They sleep in bed with their owners, they share their homes with kids, they probably chewed up their humans’ shoes when they were pups. And, yes, their paws DO smell like corn chips, just like your dog’s paws – we checked. They’re real dogs. Real dogs that participate in a sport. And, like any other dog sport, it takes time, training, socialization and a natural disposition that makes them right for the sport. Dogs are well-socialized from birth and are introduced to conformation shows very early on, sometimes as young as 6 to 8 months old. Proper socialization is hugely important for show dogs. A dog that perfectly conforms to his breed standard won’t stand a chance if he’s skittish, fearful, or aggressive. And grooming. Oh, so much grooming. 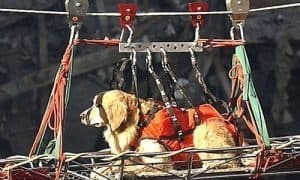 In the same way an NFL player trains for months and then gets geared up for game day, the dogs showing at Westminster begin preparing well in advance of taking to the show ring. 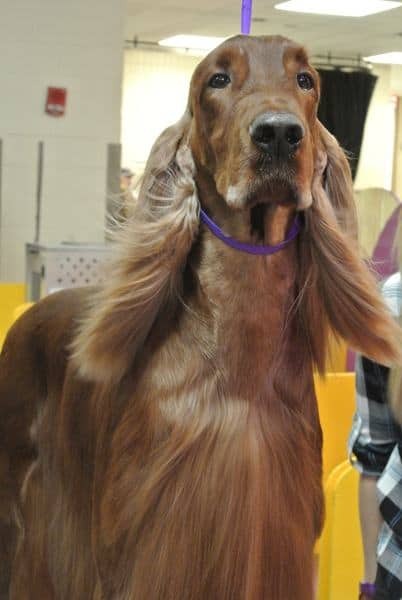 Adrian, the Irish Setter keeps his red locks luxurious with the help of Pantene shampoo and conditioner. IMAGE: The Dogington Post. A walk through the show’s backstage benching area (where all the dogs and their teams are lined up in individual cubbies, getting primped and pampered before their turn in the ring) displays a variety of grooming products and tools more impressive than an entire aisle at your local drugstore. You’ll see hairspray, volumizer, mousse, brushes, rollers, clips, combs, clippers, sponges, spray bottles, blow dryers, and (yes) flat irons, along with some unusual accoutrements like corn starch and rubber gloves – all serving a specific purpose: to look as perfect as possible for the judge. Even the Best in Show winner, Flynn, has his nose dusted with a shimmery powder his handler calls “Fairy Frost” to dry the drool from that perfectly coifed, splendidly fluffy face. 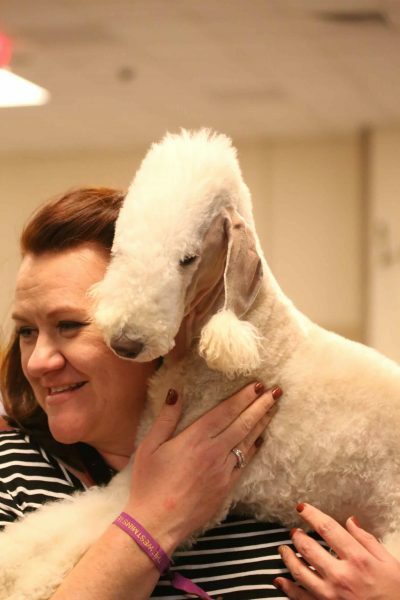 Monte Carlo, the 4-year old Best in Breed Bedlington Terrier has one of the most unique grooms for the ring, with his face, ears, and chest shaved to the skin, while the hair on his head is brushed and fluffed, giving him a striking appearance when compared to other, more common haircuts. But, this unusual groom was originally created to serve a purpose! Originally used by miners in Bedlington, England, the Bedlington Terrier was bred to hunt badgers, rabbits, and rodents commonly found hiding out in coal mines. The small, agile, and fast dogs were sent into mines to clear out any vermin so miners could safely enter. The practice of shaving the dogs’ face, ears, and chest originally began for hygienic reasons – these were the areas of the dogs that most often became dirty and required serious cleaning after each hunt. And, since Bedlington Terriers served dual purpose as bed-warmers in their owners’ homes, being able to quickly wash them before heading inside to snuggle up for the night was essential. It’s not unusual to see a groomer spend upwards of twenty minutes perfecting a single ankle pouf on a Poodle, or getting just the perfect amount of height on an Old English Sheepdog’s head by teasing, and brushing, and teasing, and brushing again. Yes, that millimeter of height or single misplaced hair could mean the difference between Best in Breed and runner-up when the competition is especially tough. Speaking of the competition – this is where many don’t realize what this show is really about. A lot of people ask, “How could you compare a Rottweiler to a Chihuahua and pick the best one?” Well, you don’t. In conformation shows, the dogs are judged solely against their breed standard, not against other dogs. 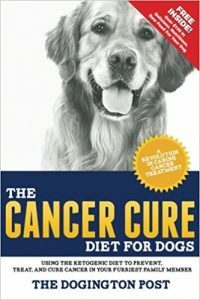 So, for example, in the Golden retriever breed category – of which 32 dogs entered this year – the Best in Breed winner was the dog that most conformed (get it?) to their breed standard. Following the individual breed competitions, the winners of each breed move on to the Best in Group competition. There are 7 groups: Herding, Sporting, Non-Sporting, Working, Toy, Terrier, and Hound. Every Best in Breed dog from the Herding Group, for example, goes before a judge who determines which Herding Group dog best conformed to their breed standard – so while a Border Collie may enter the ring alongside a Corgi, they aren’t being judged against each other, but against their own breed standard. After the 7 Best in Group winners are selected, those dogs will move on to compete for Best in Show – again, not against each other, but against their own breed standard. This year’s Best in Group winners in each category were: From the Toy Group, “Biggie” the Pug; Herding Group, “Slick” the Border Collie; Non-Sporting Group, “Flynn” the Bichon Frisé; Hound Group, “Lucy” the Borzoi; Sporting Group, “Bean” the Sussex Spaniel; Working Group, “Ty” the Giant Schnauzer; and Terrier Group, “Winston” the Norfolk Terrier. 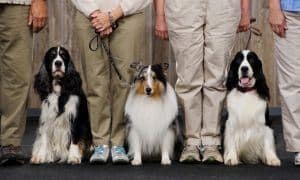 Of the 7 Best in Group winners, 4 breeds have never won the top spot at Westminster: a Border Collie, a Borzoi, a Giant Schnauzer, or a Norfolk Terrier, making it an especially exciting evening for fans of those breeds, hoping to finally see their favorite take home the enormous ribbon. And, Sussex Spaniel, Bean, wooed the crowd and made himself a fan favorite by “sitting pretty” in the ring. You can see in the video above, the Best in Show judge,Betty-Anne Stenmark, takes time to carefully inspect each dog. Naturally, she’s admiring the magnificence of each dog, but she’s also looking for very specific characteristics – skeletal structure, coat and skin condition and texture, teeth, ear placement, the way the dog holds their tail. And when the dogs make their way around the ring, she’s watching their posture, gait, energy level, and even personality that shines through. And, while the dog is, of course, the main focus, having the right handler can make or break their moment in the judging ring. Having the right handler (that’s the person that walks the Best in Show-hopeful onto the ring and trots around the floor as directed by the judge) can mean the difference between taking home the big ribbon or heading home early. 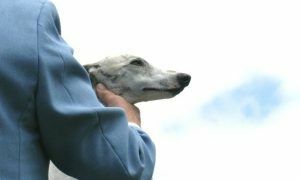 Aside from growing attached and well-bonded to the dogs they work with, the handlers play a vital role at the dog show. A dog needs to be totally comfortable in the ring, confident, alert, and content and the right handler can make all the difference. 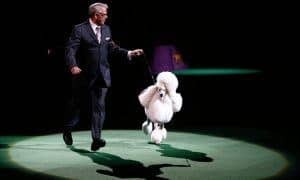 While walking the dog around the ring, the handler watches closely for gait, posture, and stance and immediately corrects the dog with very subtle, expert leash handling and tricks like appropriately timed treats or finger snaps. Dog handling is an art and the handlers at Westminster are the best artists in the business. Speaking of treats, most handlers hold them in their mouths while on the show floor. Watch a dog show closely and you’ll see the handler pulling treats from their mouth, offering a bite to the dog, and putting the remainder back in. Yes, it’s a little odd, but there’s a reason they do it – and, no, it’s not some subtle way to display dominance as some have suggested. Simply enough, a treat in the hand, or in a pocket, is distracting to the dog. And, if a dog is looking for a treat, he’ll look at his handler’s face, or the judge’s face – the perfect place to look when being judged. Besides being healthy, this trick is also part of the reason why dogs in the show ring are usually rewarded with cooked chicken, steak, cheese, or hot dogs instead of regular dog treats or biscuits. A lot of dog handlers joked about mistakenly putting a dog treat or liver in their mouths by force of habit in the ring. Handlers also carefully consider their outfits before hitting the ring. The standard dress-code is “business attire” but, more important than just dressing appropriately for the event, handlers choose clothes that complement or enhance the dog’s appearance, without distracting from it. For example, a handler showing a black dog would never wear a black suit or dress because the dog would disappear in front of it. And, of course, there’s practice – and lots of it. Handlers don’t just show up on show day and hit the ring (literally) running. They practice their speed, leash handling, and running alongside their dog to work out any possible kinks well ahead of judging day. And, interestingly, because they practice so much running counter-clockwise in the ring with the dogs, handlers have an unusually high rate of injuries to the hips, knees, and ankles on the left side of their body. As you can see, a LOT goes into making it to the top. 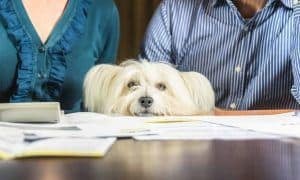 But, with so much time, money, and energy put toward breeding and showing the perfect dog, dog lovers can’t help but consider the millions of pet-perfect dogs in shelters and rescues across the country, dogs that deserve the same accolades, the same loving devotion, as their perfectly-bred cousins. 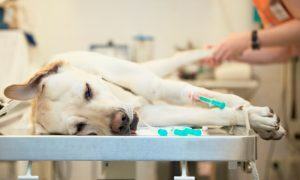 Can Dog Shows & Dog Rescue Exist Harmoniously? Since it was established in 1877, pre-dating the invention of the lightbulb and the automobile, the Westminster Kennel Club has promoted responsible pet ownership through educational programs and fostered community efforts through programs that give back. At its first show in 1877, Westminster donated all the proceeds from an entire day to the ASPCA to establish a home for stray and disabled dogs. That donation has continued for each of the 141-years since. Over the years, the organization has helped to raise millions of dollars through various programs in support of homeless dogs and shelters, while holding strongly to the belief that teaching responsible dog ownership is paramount to solving our nation’s pet overpopulation problem. Could passion for animal rescue and responsible pet ownership be misdirected as anger or resentment toward conformation shows like Westminster? Remember, the dogs participating in Westminster are not the product of puppy mills but are bred by responsible breeders that love these animals. The puppies produced by champion show dogs would never be found in a lonely cage at a pet store, sitting atop a wire crate lined in newspaper. They don’t end up in shelters or on the streets. 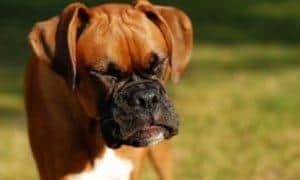 Some argue that conformation shows create an unhealthy image or standard by which most dogs can’t compete, that breeding for conformation has all but ruined several of the popular breeds we know and love, and that it supports inhumane procedures like cropping ears and docking tails. But, things are changing. For dogs to compete at Westminster these days, they must have a proven, solid, healthy background, without congenital, skeletal, or bred defects. And, although ear cropping and tail docking is still the norm, last year we met Teresa LaBrie and Duesy, a stunningly handsome Great Dane entered with his ears big and naturally flopping as he pranced around the ring. Although Duesy didn’t win, it gave many of us hope for a floppy-eared future at Westminster.